A chance encounter at a party between electro-pop singer Anita Lixel and designer Jiri Vanmeerbeeck proved a creative meeting of minds that led to innovative packaging for Anita's debut single, "In Your Game...Boy." "Utilia's process is very much hands.on and driven by gut feeling" explains Jiri. His innate understanding of Anita's fan base offered a starting point for the design, which needed to align with two key cultural themes: disposability and sharing. As a limited edition of 500, the production budjet was tight. 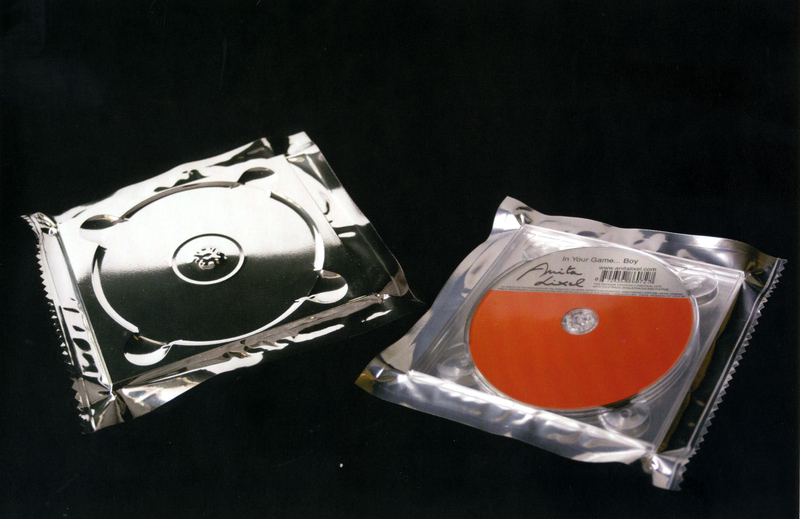 The design consists of two transparent plastic CD trays, vacuum-sealed in a silver and transparent plastic bag. "Anita's look du jour was Edie Sedgwick," reflects Jiri, "so I took Andy Warhol's Silver Clouds installation as inspiration. The bag has a notched edge so you can easily tear it open, just like a candy bar." The silk-screen printing on the CD was limited to two colors to save costs, and all information, including the bar code, is on the CD surface, "handwritten - with the charm of a demo tape." "As for sharing" continues Jiri, "to anticipate this in a positive way, each pack includes two identical CDs. The other one is to give away - so the packaging became a greta vehicle for viral marketing. Some months later, a major label (in Belgium) followed this exemple." Jiri knew that if Anita approved, her fans would too. "In this case the client was the stereotype of her audience - the i-Generation, computer-savvy, always online crowd. She absolutely loved the design on first sight."